<-- Follow the Farmland Basketball League on twitter for the quickest score updates and other FBL news. 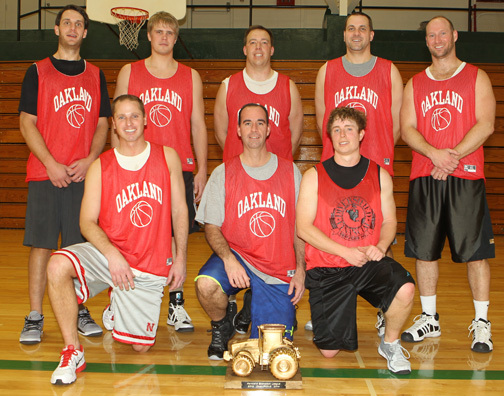 For the second straight year, Oakland went on the road to Howells for the Farmland championship game and came away with the Golden Tractor Trophy. Oakland won its third FBL title in four years with a 73-62 win over top-seeded Howells. Click here for the 2014 playoffs bracket. See the 2014 All-Farmland team here. Preseason meeting: The league has also split up into two divisions for the first time. Division champions will recieve the top two seeds in the six-team playoff bracket and get first-round byes. For other developments from the Nov. 12 pre-season league meeting, click here. Howells def Pender - fft. Dodge def. Pender - fft. WP Cowtippers def. Pender via fft. West Point Ducks def. Pender via fft. Oakland def. Pender via fft. The teams of Farmland League would like to thank our sponsors for making the FBL possible. Thanks for supporting town team basketball!